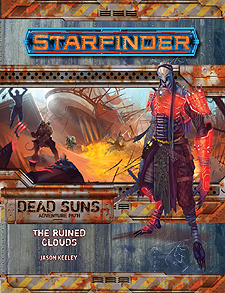 Still on the heels of the Devourer cult, the heroes head to a distant, uncharted star system, where they find the ruins of an ancient alien city floating in the atmosphere of a gas giant. Exploring the ruins, they encounter the degenerate descendants of a highly advanced species that once controlled the lost superweapon the heroes are searching for. Through the legends and superstitions of these primitive folk, the heroes can piece together clues to the superweapon's hidden location and the key to unlocking its power - an impossibly huge megastructure that the Cult of the Devourer is intent on seizing! An archive of new creatures, from living holograms and twisted mutants to supernatural agents of the Devourer, by Jason Keeley and Owen KC Stephens.